So I'm pretty sure no one wants to hear about my Valentine's Day, though I did go to the Cheesecake Factory and I paid for our meal. No I didn't pay because he's broke, but I believe in an equal relationship, so we take turns paying for things and holding doors open for each other. In other new, I'm pretty sure you'll want to hear about the RENAISSANCE FESTIVAL!!!!!!!!!!!!!! Myself and a group of my friends went to the Renaissance Festival on Saturday. My roommate's parents were here for the weekend as well, so they tagged along. We ordered the Pleasure Feast tickets, and I'll explain that later. First, we went to the Tortuga Twins play about Robin Hood. It was an audience participation, so they actually got people form the audience to go up to the stage and act out the scenes they were describing. It was pretty awesome and funny. After that, we walked around the whole festival and checked out the shops. We saw the last couple of jousts from the jousting event. The guys were in armor and charging on their horses. A few lances were shattered. I actually got a complement on the outfit I wore, which I did not get a picture of, but it's the same one I wore for Halloween. The only difference is since it was 85 degrees outside, I wore thin green stockings instead of the brown fleece ones. Besides all of the awesome merchandise, we ran across this lady that was pulling a wooden sheep behind her. It was on wheels and had wool all over it with some paper eyes. We walked up and started petting it and she asked to guess his name. We guessed and got a hint: "What do sheep say?" Well, they say baaahh, so his name was Baaaaahb. HA! Get it? By this time it was time for the five course feast with entertainment. We got there and got in and there was an appetizer of cheese, almonds, grapes, and 3 different breads. The Feastmasters were fantastic. One was "English" and the other was "Scottish". They provided most of the funny entertainment by throwing insults back at each other. It was pretty grand. 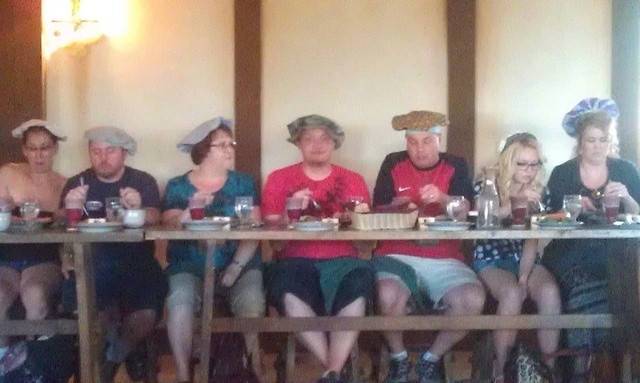 We then got salad served to us and our entertainment was some traditional English dancing. After that was corn of cauliflower soup, which was actually really delicious, and we got a display of lots of timed banging sticks and we had to bang on the table with the beat. Then we got our main course which was some slow roasted beef and really good chicken. There were also carrots covered in black pepper and some rice. Belly dancers came out for the main course. Then we got dessert and I don't even know what kind of pudding and pastry it was, but it was good. We had a Scottish "band" come out and play. 2 of them had big drums and 2 of them had bagpipes and all 4 were wearing kilts. The music was actually really good. This is the only picture I got of the Renaissance Festival, and it's of my roommate and his parents sitting across the hall. They made everyone wear those hats. I wore mine over my own hat. Cory (center) and his parents on the left and right of him.